Normally I like to end the week with something sweet, but after enjoying this dessert this past Sunday, I wanted to share this cream cake with you ASAP. If there are any of you who will be hosting a Cinco de Mayo fiesta this weekend, you are looking at a cake with the potential to bring the house down. And it is not as hard to make as it looks. This cake covers a lot of territory. Taste? The tang of the cream cheese is joined by flaky coconut, a tropical note of lime, and, yep, the terrific twin terrors of tequila and triple sec! The texture is of three levels. 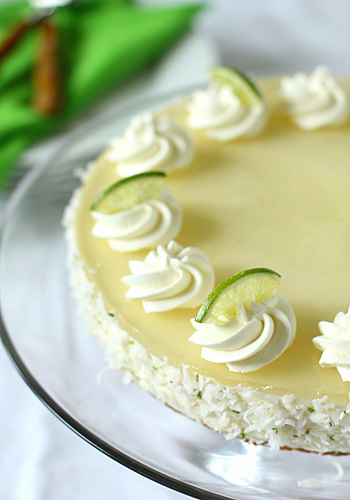 The luscious, creamy body of the cake is topped with a shimmering disc of margarita flavored gelatin. The cake rests on a crunchy crust that names crushed pretzels as its main ingredient. It is a yummy stand-in for the salty rim of the traditional cocktail. Finally, the presentation intrigues the eye and the tongue, making refusal of at least a bite slice virtually impossible. Now you can have your drink and eat it too! Place the oven rack in middle position and preheat to 350° F. Line the bottom of a 9-inch non-stick spring-form pan with parchment paper; set aside. In a small bowl, combine the coconut and lime zest; reserve 1/2 cup. In the bowl of a food processor, combine the remaining coconut and pretzels and process until finely ground. Add the melted butter and pulse to combine. Press the mixture into the bottom of the prepared pan. Bake until the edges are golden, about 10-12 minutes. Cool completely on a wire rack. Once cool, spray the inside edges with non-stick spray. In a small saucepan, combine 1/4 cup of the water and gelatin and let sit until gelatin softens, about 5 minutes. Add margarita mix, tequila, and Cointreau/triple sec and cook over low heat, stirring frequently, until gelatin dissolves, about 5 minutes. Cool for 15 minutes. In a medium bowl using a wire whisk or hand-held mixer, whip the cream until soft peaks form. In a separate large bowl, beat together the sweetened condensed milk, cream cheese, and vanilla. Add 1 cup of the cooled margarita mixture and beat until incorporated. Using a rubber spatula, fold in one-third of the whipped cream, then gently fold in remaining cream. Pour the filling into the crust. Refrigerate until just set, about 1 hour. Stir the remaining 1/2 cup water into the remaining margarita mixture. Pour the mixture through a fine-mesh sieve into a 2-cup liquid measuring cup. Pour the filling and refrigerate until set, about 4 hours. Carefully run a sharp paring knife between the cake and the sides of the pan, pressing against the pan. Remove the sides of the pan. Press the reserved coconut mixture onto the sides of the cake. 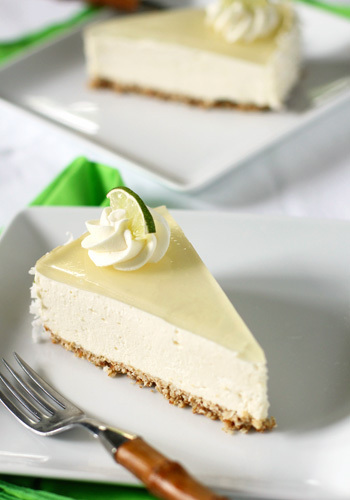 Garnish with whipped cream and lime wedges. Enjoy! That is one fantastic cake! I would have a slice for sure! That is absolutely gorgeous. And I love your beautiful writing and descriptions! Oh my gosh you are talented! I'm looking forward to trying this recipe! I've seen margarita cupcakes, but never anything like this. Your photos of it are beautiful. Looks so good! I made this last night, but had trouble with the top gelatin layer. After straining it, when I poured the marg/water mix on top, it ran over the sides and down through and out of the pan. Suggestions? The filling should be spread completely to the inside edges of the pan. It is not baked, so the cream filling should not pull away from the sides of the pan once set. It sounds like there was a gap in between that would allow the gelatin mixture to seep. Sorry you had trouble. Hi Nicole, just wondering...... Do you have any ideas as to why when I click on a "You Might Also Like" at the bottom of a recipe, the links are broken? I was able to click on them, so I am not sure. It is a Linkwithin widget, not Blogger. I will try and look into it. Can you sun limeade for the margarita mix? I have gone to 3 stores and can't find it. I am not familiar with sun limeade, but if it a sweet and sour mixture it should work fine. This looks delish! I wonder if there is a way to make it without the alcohol? The alcohol is cooked out in the gelatin, but if you did want to remove it completely you would need to make up for the loss of liquid by adding more margarita mix. 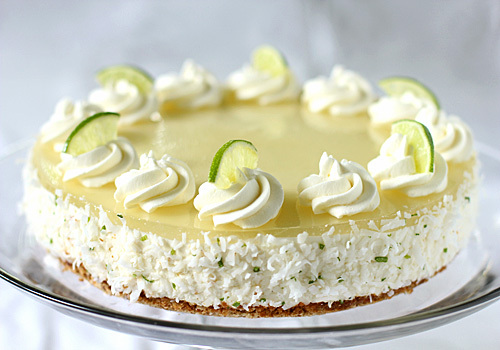 I would just love to make this but am in Australia and can't buy Margarita mix...what do you think I could substitute in it's place? You could try mixing equal parts water, granulated sugar, freshly squeezed lime juice, and freshly squeezed lemon juice. What does straining the gelatin through a sieve do exactly? I tried this once before, but it didn't seem to catch anything. 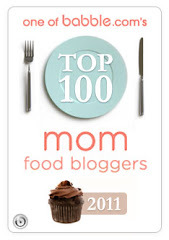 I also had the same issue as Lori, I poured the gelatin layer over the top & set it in the fridge overnight. I came to check on it the next morning & didn't see a gelatin layer, thought maybe it was absorbed into the cake! Found out later it had somehow escaped over the side & through the bottom of my spring form pan & was on my refrigerator shelf :) Even there, the gelatin was still quite liquidy. Straining the mixture ensures that the top layer is completely clear without any possible pulp from the margarita mix. As for the gelatin layer seeping, I do not understand why it would happen. The filling has to spread completely to the sides of the pan. Try making the filling slightly higher at the edges to keep the top gelatin layer from seeping. I did not have to do this, but it may help you.